Most Mississippians recognize Eudora Welty (1909-2001) as one of the state's most revered authors, but not very many know that she was an avid gardener or that her home in the Belhaven neighborhood of Jackson is a National Historic Landmark and open to the public. The Eudora Welty House was restored by the Mississippi Department of Archives and History (MDAH) and is available to tour by reservation. MDAH is assisted in its efforts maintaining the home and grounds by the Eudora Welty Foundation. 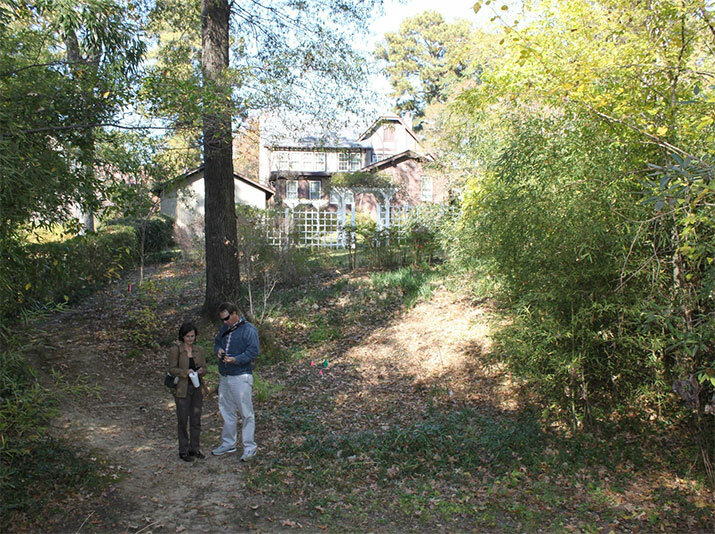 Like any preservation project, the Eudora Welty House requires ongoing planning and management to maintain the integrity of the home and garden. In particular, the landscape poses a number of difficult and on-going challenges as plants grow too large, die or are out-competed. Recently, the Department of Landscape Architecture at MSU was asked to assist with planning for the long-term management of the Welty landscape. Several members of the faculty spent a day and a half at the property meeting with various stakeholders and studying the Welty garden in detail. The project was instigated and organized by author and garden restoration consultant Susan Haltom. Haltom is co-author of One Writer's Garden: Eudora Welty's Home Place which documents the history of the landscape and the Welty family's love for gardening. Haltom is also the organizer of a group that calls itself "The Cereus Weeders." Named after one of Welty's favorite plants (Night-blooming Cereus), The Cereus Weeders have generously volunteered their time helping to restore, manage and maintain the garden. Assisting The Cereus Weeders are local landscape contractor's Eric Hays (of Eric Hays Landscaping) and Andrew Bell (of Sustainable Solutions). Although the garden has largely been restored, everyone involved would like to develop a long-term plan for management of the garden. A landscape management plan for a historic garden is significantly undertaking and much more challenging than an average maintenance plan. In the case of the Welty garden, there are a number of long-term issues to be addressed such as when to replace trees and plants that have died or overgrown their location, what equipment to use for maintenance in order to maintain an authentic aesthetic and how to replace varieties of plants that are no longer commercially grown. Dr. Tim Schauwecker (who administers the Landscape Contracting and Management program) and Brian Templeton who is a landscape architect and an Extension Associate at MSU have been leading the project and are currently working to complete a draft of the landscape management plan for review. The Department also hopes to continue its relationship with the Welty House and is exploring more ways for students to become involved in cost estimation, sign design and interpretive graphics related to the museum.